(CNN) - As temperatures plunge across the country, staying indoors and warm is not always an option for the nation's homeless. The National Weather Service warns that hypothermia can occur in temperatures even as high as 60 degrees Fahrenheit, especially if the person isn't properly dressed. Homeless populations are particularly vulnerable since they have significantly fewer places to take refuge from the weather and less ways to protect themselves outside. 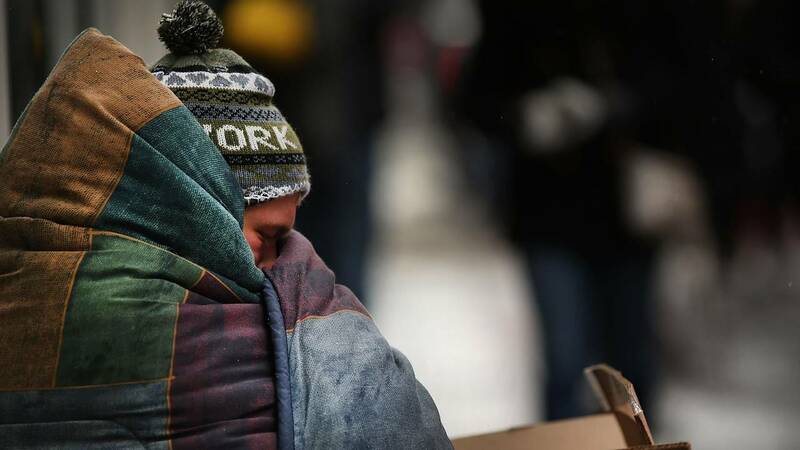 "Anything under 40 degrees Fahrenheit is considered cold," Kevin Hall, program director for the Salvation Army in Atlanta, told CNN. "On the norm, we check the weather around 4 p.m. and if it's going to be cold, we let people in our shelters know to be prepared." Nancy Powers with the Salvation Army's Chicago Freedom Center suggests keeping care packages in your car to give to the homeless, especially people who refuse to go to shelters. She said that "shelf-safe food, tuna or chicken in packets" are good items to include. To help ward off frostbite, Powers recommends including gloves, socks and hand warmers. Outside of care packages, Powers said a lot of homeless people "do not have sufficient footwear. A lot of times they have beat-up tennis shoes." She suggests giving them an extra pair of boots or shoes. About 60 cities, including New York, Chicago, Boston, Washington and Baltimore, maintain a 311 number to report a person who needs help on the street and that can connect you to homeless outreach teams. Another good number to know is 211 -- a shortcut that will help connect about 90% of the US population with local, essential community services. If the homeless person is a veteran, the Veterans Administration also has support services specifically for former service members. Other cities also have specific hotlines, but if in doubt, you can always call your local police precinct. Homeless shelters and relief organizations are always taking donations. Cold weather items are especially useful this time of year. "Coats are good -- not everyone has a coat when they come (to a shelter)," the Salvation Army's Hall said. "Also, blankets are really useful." Miniature hygiene items such as toothpaste, shampoo, and body wash are also good to donate. But Hall said to stay away from full-size bottles. "The single woman and single male want to carry (as) little as possible. That's why we ask for miniaturized items." Some relief groups collect gift cards to distribute to the homeless population. You could consider putting gift cards in care packages that you might distribute. Ultimately, as temperatures plummet, it's important to get people to shelters or at least connect them with resources. "No matter who you are, you're a human being, and we'll try and accommodate you," Hall said.